Last week, Earth and Environmental Science took a whirlwind tour of space and the interactions between the Sun, Earth, and Moon. I think in the future I will probably spend more time on this fascinating unit. The short taste that we get now just isn't enough. This week we have one week in review (2/20-2/24) from Jatiyah Walker. What we learned in class was the sun's atmosphere. The sun's atmosphere contains a photosphere,a chromosphere and the corona. The photosphere is the outermost layer and is approximately 400km thick. Above the photosphere is the chromosphere. 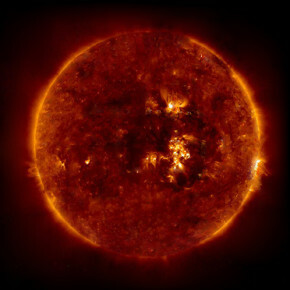 The chromosphere is 2500km thick and had a temperature of 30,000k. The top and outermost layer is the corona. The corona expands several million kilometers from the top of the chromosphere. What I found was interesting was the video and it's features and how it effects the earth. To conclude, I think that I have learned a lot from this week.